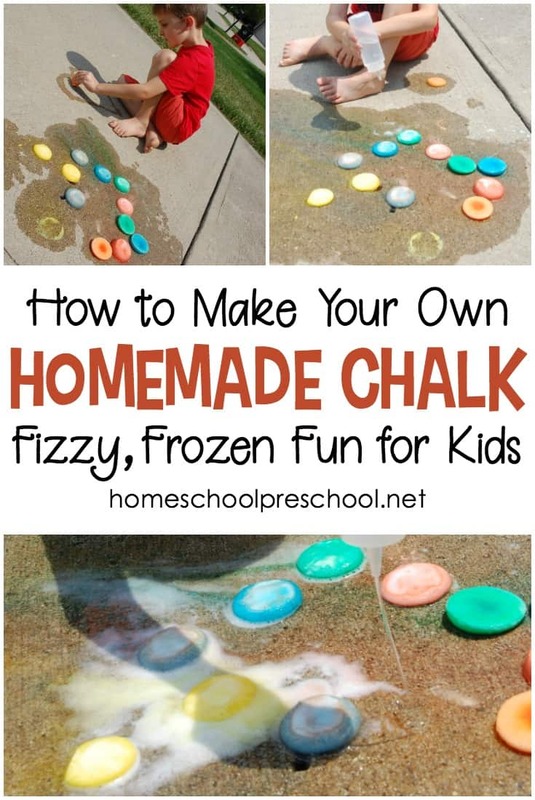 Follow this simple recipe for homemade frozen sidewalk chalk for kids. You’ve likely got the ingredients in your pantry, and your kids will have a blast! Surprise your kids with a batch of frozen sidewalk chalk, and you’ve got everything you need to keep them busy on a hot summer afternoon. 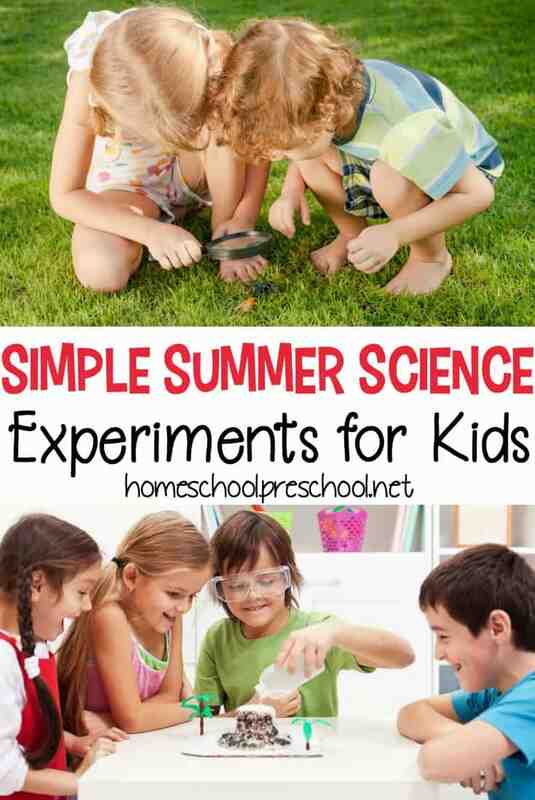 It will soon become one of your child’s favorite summer activities. 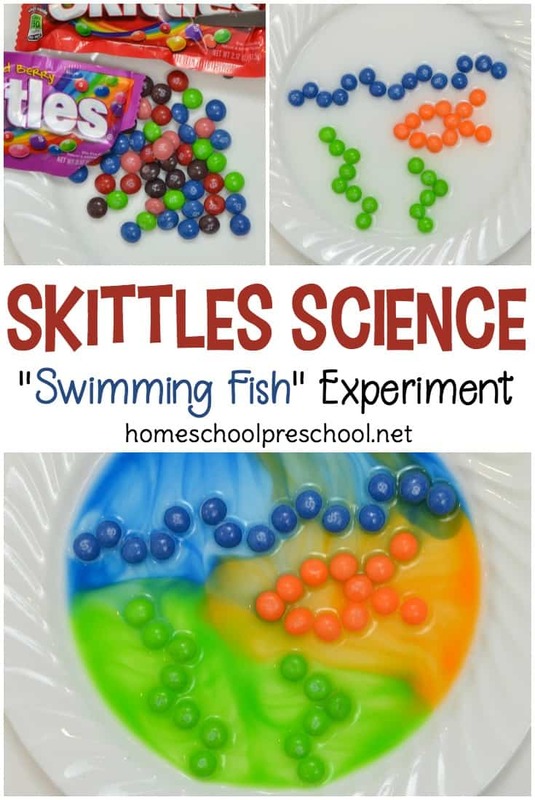 Combine art, science, and sensory fun in one hands-on activity! Last summer, my six-year-old nephew came to visit for a week. When he visits, he always asks if I have any “work” for him to do. What he’s really asking is, “Aunt Tara, will you pay me a dollar to do some really fun crafts so you can put the pictures on your blog?” And, I always oblige! On this particular day, we made some frozen sidewalk chalk with a fun twist. Actually, we made the chalk the day before since it has to freeze. But, Isaiah loved drawing with the melting chalk and had even more fun watching it fizz. • ice cube tray, popsicle molds, muffin tin, etc. Mix it up. That’s all you need to do. Mix the baking soda and water. We poured the mixture into a muffin tin, because that’s what we had on hand. You could use an ice cube tray or a silicone candy mold for shaped cubes. 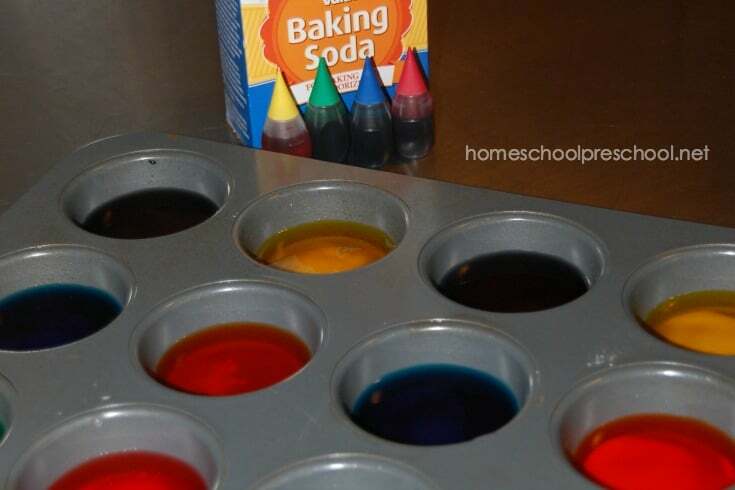 After pouring the mixture into the muffin tin, I added a few drops of food coloring to each individual cube. If you don’t have any food coloring on hand, you could use liquid paint or even kool-aid (which will make some fun scented chalk cubes). Now, just freeze the liquid until it’s frozen solid. Now that the chalk is frozen, it’s time to head outside. Isaiah loved making designs with his sidewalk chalk. He also loved just watching the colors mix as the chalk melted in the hot sun. But, the best part came when I handed him a squeeze bottle full of vinegar. 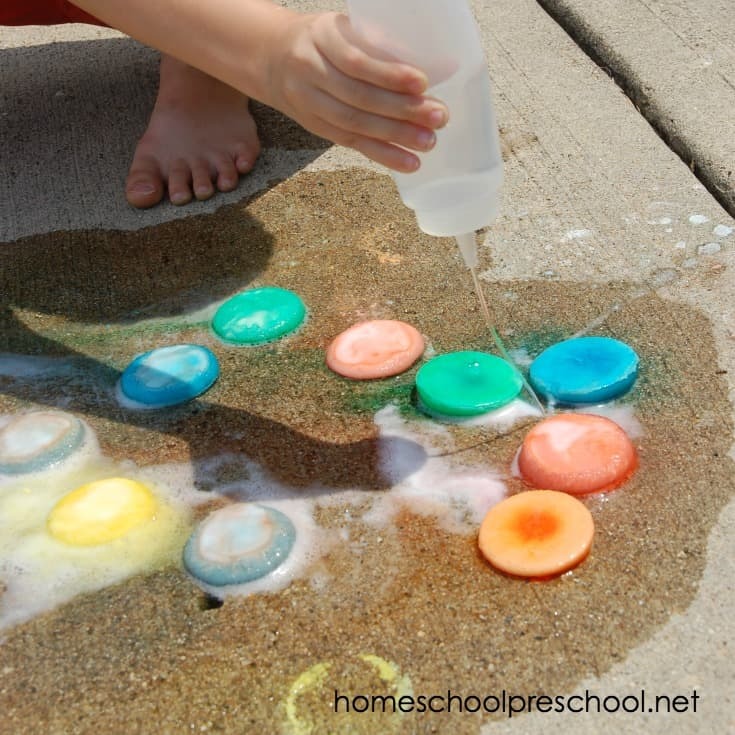 When the vinegar is squirted on the baking soda in the chalk, it fizzes. He had a blast making his chalk and the designs fizz. 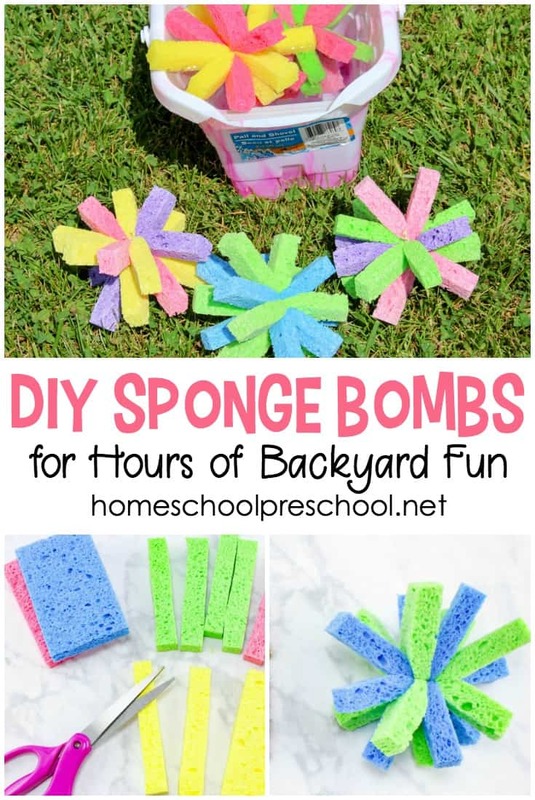 What will your kids design with this fun sidewalk chalk for kids tutorial?